Gorgeous details can turn a so-so home into a beautiful, polished haven — think crown molding, luxe lighting, chic hardware and dreamy decorative objects. But all too often a powerful design detail is left off the list: interior doors. The right ones can bring elegant cohesion to a home, reduce noise and may even save space. If you’ve been neglecting your interior doors, it’s time to unlock their potential. Start with these styles from Jeld-Wen, a global manufacturer of doors and windows, to explore this key design upgrade. Sleek and chic, contemporary style is all about clean, calming minimalism with an emphasis on line and form. 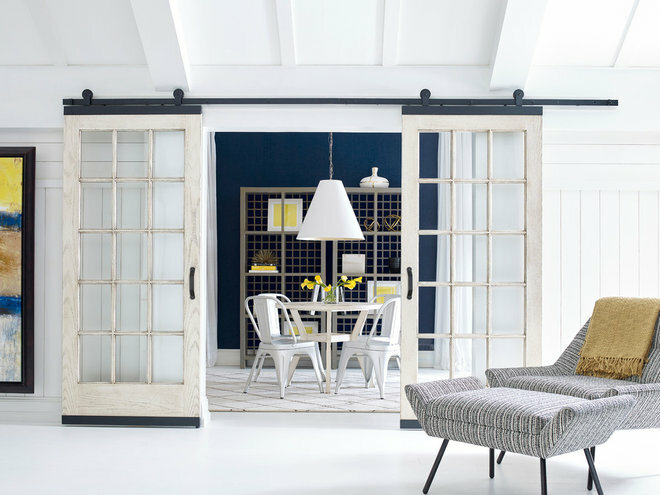 Glide right into this aesthetic with a glass-paneled door. Its simple profile is an about-face from traditional molded doors and adds of-the-moment sophistication. Select frosted glass to subtly conceal spaces, or choose clear panels to let in light without the noise. Mix in abstract art, sculptural shapes, matte metals and muted neutrals to complete the look.Tip: Install a barn door in tight spaces, such as a kitchen pantry, to maximize square footage and avoid traffic accidents. DIY-friendly hardware lets you mount any standard-size door as a barn door, avoiding the costs of custom doors or reframing. Evoking images of rolling hills and fresh country air, farmhouse style is cozy and charming — it makes you want to snuggle up by the fireplace. And it’s not just for those with rural acreage. Try white Shaker-plank doors, such as the ones used in this entryway, to enjoy this style anywhere. Add beadboard wainscoting, rough-hewn stone and warm wood to further the look, and finish with oil-rubbed hardware for a pleasing contrast.Tip: Consider a composite door for spaces that see a lot of use, such as an entryway closet. Less expensive than solid wood and more durable than hollow-core doors, composite doors require little maintenance and stand up to dings and moisture. Born at the turn of the 20th century, the Craftsman style celebrates meticulous workmanship and purity of design. Imbue your home with this aesthetic, doors included, for a distinctly American feel. Recessed flat panels, simple lines and character-filled wood are Craftsman door hallmarks. 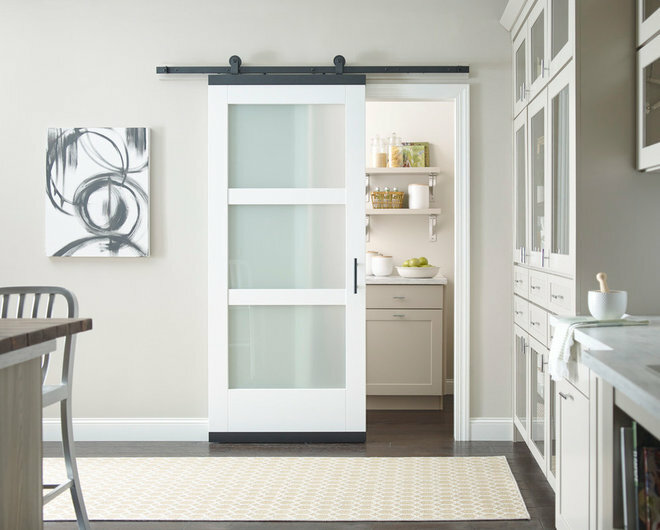 Add barn door hardware and a nickel pull for a more modern rendition, as seen here. 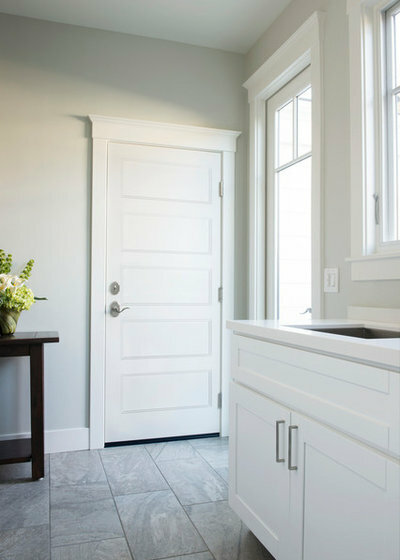 Paired with crisp white walls, higher ceilings and neutral transitional furniture, it’s a fresh take on a heritage style.Tip: Embrace the Craftsman style by using solid wood doors, or get the look for less with composite doors stained to look like wood. If you choose solid wood, inspect your doors annually to preserve their finish and functionality. Natural wood can shrink and expand with changes in humidity. Anything but antiquated, classic door designs offer a portal to the past. The Colonial-style molded door — identified by six raised panels — is a popular standby, but turn to your home’s style for specific inspiration. You might find, for instance, that Italianate arches or slim Victorian panels better suit your aesthetic. The five-panel door with stepped sticking — the detailing around the panels’ perimeter — seen here complements this bathroom’s classic trim. And don’t forget the hardware: The right handle and hinges can bring further authenticity and unity to your interior design.Tip: Pay attention to noise transmission when choosing a door, especially one for a bedroom, laundry room or home office. Certain composite doors can reduce noise transmission by 50 percent compared with more wallet-friendly hollow-core doors.